다른 뜻에 대해서는 난시 (동음이의) 문서를 참조하십시오. 난시(亂視, 문화어: 란시, 의학: astigmatism)란 안구에 입사된 빛이 망막 위의 한 점에서 초점을 맺지 못해 시야가 흐려지는 시력장애, 혹은 그러한 시력장애를 갖는 눈을 일컫는다. 0.6 디옵터 미만의 난시의 경우 정상에 속하고, 0.6부터 2 디옵터까지는 낮은 난시, 2부터 4 디옵터까지는 중등 난시, 4 디옵터를 초과하면 고도 난시이다. 난시는 각막이나 수정체의 불규칙 또는 원환체 만곡이 원인이 될 수 있다. 난시에는 규칙난시와 불규칙난시의 두 가지 유형이 있다. 불규칙난시는 종종 각막 흉터나 수정체의 산란에 의하며, 표준 안경 렌즈로 교정될 수 없다. 이보다 흔한 규칙난시는 각막이나 수정체가 원인이 될 수 있으며, 안경이나 난시렌즈로 고칠 수 있다. 원환체의 표면은 럭비공의 한 부분이나 도넛을 닮았고, 이러한 광학적 모양이 눈의 난시를 일으킨다. 난시의 굴절이상은 가로와 세로의 곡률이 다른 것에 기인한다. 예를 들면, 망막의 수평면에서는 상이 정확하게 맺힐 때 수직면에서는 그렇지 못하다. 난시는 시야가 흐릿해져 세세한 부분을 알아보기 어렵다. 난시의 치료에는 안경, 콘택트 렌즈, 시력 교정 수술 등의 방법들을 선택할 수 있다. 학생으로서 토머스 영은 1793년 자신의 한쪽 눈에 문제가 있음을 발견하였다. 여러 해에 걸쳐 그는 자신의 눈 문제에 대해 연구를 계속하였다. 그는 1801년 자신의 발견을 베이커 강연에 제시하였다. 토머스 영과는 별개로, 조지 비델 에어리는 자신의 한쪽 눈에 난시가 있음을 발견하였다. 에어리는 자신의 눈에 일어난 발견을 1825년 2월 케임브리지 철학회에 제시하였다. 에어리는 1825년 자신의 안구 문제를 교정하기 위해 렌즈를 생산하였으며,  1827년의 다른 출처에 따르면 에어리는 입스위치의 한 안경사로부터 원기둥 렌즈를 받았다. 이 질환은 에어리가 아닌 윌리엄 휴얼이 이름을 붙였다. 1860년대에 난시는 안과에서 개념이 잘 확립되었으며, 여러 서적의 장(章)들이 난시의 발견을 기술하였다. 사실 난시는 많은 사람들에게서 볼 수 있는 현상이지만 대개 그 정도가 약하므로 시각에 크게 문제가 되지는 않는다. 난시가 증상으로 간주되더라도, 고도 난시는 흐릿한 시야, 눈을 가늘게 뜨고 보려는 현상, 안정 피로, 피로감, 두통을 야기할 수 있다. 일부 연구에 따르면 난시와 고도의 편두통 간의 연결 고리가 있음을 지적하고 있다. 선천적으로 혹은 각막에 생긴 상처 자국 등으로 인해 빛의 굴절력이 빛이 입사되는 방향에 따라 달라져 생긴다. 수정체나 결막 등에 생긴 수술 자국 등도 원인이 될 수 있다. 주경선의 축에 따라 정난시와 부정난시로 구분된다. 이 둘은 빛의 굴절력에 차이를 가져오는 원인이 서로 다르다. 정난시 - 주경선은 수직이다. 각막의 곡률이 방향에 따라 다르기 때문에 발생한다. 사난시 (경사난시, Oblique astigmatism) - 가장 가파른 곡선이 120~150도와 30~60도 사이에 위치한다. 부정난시 - 주경선은 수직이 아니다. 상처나 염증의 흔적이 각막에 남아 울퉁불퉁해지기 때문에 발생한다. 단순 원시성 난시 - 최초 초점선이 망막에 맺히지만 두 번째는 망막 뒤에 위치한다. 단순 근시성 난시 - 최초 초점선이 망막 앞에 맺히지만 두 번째는 망막에 맺힌다. 복합 원시성 난시 - 두 초점선이 망막 뒤에 위치한다. 복합 근시성 난시 - 두 초점선이 망막 앞에 위치한다. 정난시이든 부정난시이든 난시는 외부(각막 표면)와 내부(후부 각막 표면, 수정체, 유체, 망막, 뇌와 안구 간 접점)의 광특성에 의해 발생한다. 난시는 주로 근시난시, 원시난시, 혼합난시의 세 종류로 나눌 수 있다. 시력 검사에서 난시가 있는지, 있다면 얼마나 심한지, 그 축은 어떠한지를 알아내기 위한 여러 가지를 검사한다. 스넬렌 시력표나 다른 시력검사표로 시력 감소를 찾아낼 수도 있다. 각막곡률계를 사용하여 각막 전면 표면 경선의 곡률을 측정할 수도 있다. 각막 형태를 보다 정확히 알기 위해 각막형태검사를 사용할 수도 있다. 자동굴절검사기나 검영굴절검사로 눈의 굴절 이상의 객관적인 추정 값을 얻을 수 있으며, 포롭터(종합굴절검사기)의 잭슨 교차원주렌즈나 검사용안경테로 측정을 주관적으로 개선할 수 있다. 포롭터로 할 수 있는 또 다른 기술로 '시계 눈금'이나 '햇살' 도표를 사용하여 난시의 축과 정도를 알 수 있다. 각막곡률계로는 또한 각막의 주요 경도의 배율 차이를 측정하여 난시를 추정할 수 있다. 난시는 안경, 콘택트 렌즈, 시력교정수술을 통해 교정할 수 있다. 안구의 건강 정도, 굴절 상태, 생활 양식을 동반한 여러 고려 사항들을 미루어보고 최적의 교정 방법이 선정된다. 원추각막이 있는 환자들에게는 특정한 콘택트 렌즈를 사용할 때 안경 보다 더 나은 시력을 달성할 수 있다. 레이저 눈 수술 (라식과 PRK)은 난시 치료에 성공적인 것으로 평가된다. Archives of Ophthalmology에 출판된 한 미국의 연구에 따르면 5~17세 사이의 약 10분의 3 (28.4%)이 난시를 가지고 있는 것으로 파악되었다. 최근의 브라질 연구에 따르면 특정 도시 학생들의 34%가 난시인 것으로 확인되었다. 성인의 경우 방글라데시의 최근의 연구에 따르면 30세 이상의 성인 중 3분의 1(32.4%)이 난시를 가지고 있는 것으로 알려졌다. 폴란드의 최근 연구에 따르면 직난시가 근시 발생을 일으킬 수 있다고 보고되었다. 수많은 연구에 따르면 난시는 나이가 듦에 따라 증가한다. ↑ Eric Metcalf, MPH (2009년 1월 20일). “When Astigmatism Throws Vision Out of Focus”. everydayhealth.com. 2015년 11월 12일에 확인함. ↑ Coggin, David (1893). “Notes on the Centennial Anniversary of the Discovery of Astigmatism”. 《Boston Med Surg J》 128: 136–137. doi:10.1056/NEJM189302091280603. ↑ Atchison, David A; Charman, W Neil (2011). “Thomas Young's contributions to geometrical optics”. 《Clinical and Experimental Optometry》: no. doi:10.1111/j.1444-0938.2010.00560.x. ↑ Thomas Young (1801). “Philosophical transactions of the Royal Society of London”. 《Philosophical Transactions of the Royal Society of London》 91: 23–88. doi:10.1098/rstl.1801.0004. ↑ Levene, J. R. (1966). “Sir George Biddell Airy, F.R.S. (1801-1892) and the Discovery and Correction of Astigmatism”. 《Notes and Records of the Royal Society of London》 21 (2): 180–199. doi:10.1098/rsnr.1966.0017. ↑ Wang, Ming (2007년 10월 22일). 《Irregular Astigmatism: Diagnosis and Treatment》. ISBN 9781556428395. ↑ George Biddell Airy (1827). “On a peculiar Defect in the Eye, and a mode of correcting it”. 《Transactions of the Cambridge Philosophical Society》. ↑ “Sir George Biddell Airy, F.R.S. (1801-1892) and the Discovery and Correction of Astigmatism”. ↑ Read, Scott A; Collins, Michael J; Carney, Leo G (2007). 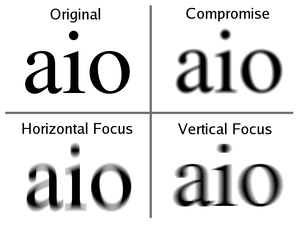 “A review of astigmatism and its possible genesis”. 《Clinical and Experimental Optometry》 90 (1): 5. PMID 17177660. doi:10.1111/j.1444-0938.2007.00112.x. ↑ Porter, Jason (2006). 《Adaptive optics for vision science: principles, practices, design, and applications》. ISBN 9780471679417. ↑ Wood, Alexander; Oldham, Frank. 《Thomas Young Natural Philosopher 1773-1829》. ↑ Donders, Franciscus Cornelis (1866). 《Die Anomalien der Refraction und Accommodation des Auges》. ↑ “The Rev. Mr. Goodrich and His Visual Problem” (PDF). ↑ Bumstead, J. F. (1863). “A Few Remarks on Astigmatism”. 《Boston Med Surg J》 69: 280–284. doi:10.1056/NEJM186311050691404. ↑ Donders, Franciscus C (1862). 《Astigmatismus und cylindrische Gläser》. ↑ Artal, Pablo; Tabernero, Juan (2010). “Optics of human eye: 400 years of exploration from Galileo’s time”. 《Applied Optics》 49 (16): D123. PMID 20517354. doi:10.1364/AO.49.00D123. 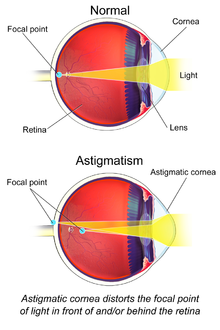 ↑ “Astigmatism”. 《MedicineNet》. OnHealth.com. 2013년 7월 2일에 원본 문서에서 보존된 문서. 2013년 9월 8일에 확인함. ↑ Harle, Deacon E.; Evans, Bruce J. W. (2006). “The Correlation Between Migraine Headache and Refractive Errors”. 《Optometry and Vision Science》 83 (2): 82–7. PMID 16501409. doi:10.1097/01.opx.0000200680.95968.3e. ↑ T. Graff (1962). “Control of the determination of astigmatism with the Jackson cross cylinder”. 《Klinische Monatsblatter fur Augenheilkunde und fur augenarztliche Fortbildung》 140: 702~8. PMID 13900989. ↑ LV Del Priore, DL Guyton (1986). “The Jackson cross cylinder. A reappraisal”. 《Ophthalmology》 93 (11): 1461~5. PMID 3808608. doi:10.1016/s0161-6420(86)33545-0. ↑ KE Brookman (1993). “The Jackson crossed cylinder: Historical perspective”. 《Journal of the American Optometric Association》 64 (5): 329~31. PMID 8320415. ↑ Azar, Dimitri T. (2007). 《Refractive surgery》 2판. Mosby Elsevier. ISBN 9780323035996. ↑ Kleinstein, R. N.; Jones, LA; Hullett, S; 외. (2003). “Refractive Error and Ethnicity in Children”. 《Archives of Ophthalmology》 121 (8): 1141–7. PMID 12912692. doi:10.1001/archopht.121.8.1141. ↑ Garcia, Carlos Alexandre de Amorim; Oréfice, Fernando; Nobre, Gabrielle Fernandes Dutra; Souza, Dilene de Brito; Rocha, Marta Liliane Ramalho; Vianna, Raul Navarro Garrido (2005). “Prevalence of refractive errors in students in Northeastern Brazil”. 《Arquivos Brasileiros de Oftalmologia》 68 (3): 321–5. PMID 16059562. doi:10.1590/S0004-27492005000300009. ↑ Bourne, R; Dineen, BP; Ali, SM; Noorul Huq, DM; Johnson, GJ (2004). “Prevalence of refractive error in Bangladeshi adults*1Results of the National Blindness and Low Vision Survey of Bangladesh”. 《Ophthalmology》 111 (6): 1150–60. PMID 15177965. doi:10.1016/j.ophtha.2003.09.046. ↑ Czepita, D; Filipiak, D (2005). “The effect of the type of astigmatism on the incidence of myopia”. 《Klinika oczna》 107 (1–3): 73–4. PMID 16052807. ↑ Asano, Kazuko; Nomura, Hideki; Iwano, Makiko; Ando, Fujiko; Niino, Naoakira; Shimokata, Hiroshi; Miyake, Yozo (2005). “Relationship Between Astigmatism and Aging in Middle-aged and Elderly Japanese”. 《Japanese Journal of Ophthalmology》 49 (2): 127–33. PMID 15838729. doi:10.1007/s10384-004-0152-1. 이 문서는 2019년 4월 21일 (일) 14:04에 마지막으로 편집되었습니다.